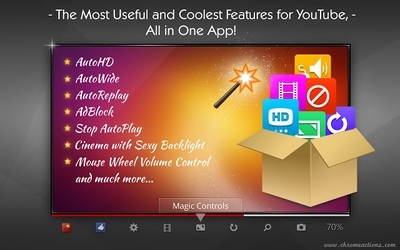 Magic Actions for YouTube is a lightweight and useful add-in designed for a more comfortable watching experience. Magic Actions is easy to use! Browser extension for Mozilla Firefox that enables you to watch animations and videos on the web. Browser extension for Opera and Google Chrome that enables you to watch animations and videos on the web. The easy way to download and convert Web videos from hundreds of sites. AdBlock simply blocks ads on YouTube, Facebook and ads everywhere else on the web. Browser extension for Microsoft Internet Explorer that enables you to watch animations and videos on the web.